Senior Hiker Magazine is a print publication by and for avid hikers over the age of 50. Our mission is to bring alive the experience of wilderness and the wild unexpected life through beautiful writing, photography and artwork. When the poisoned river ran red with heavy metals, people from Canrey Chico and nearby mountain communities didn’t believe at first that climate change was to blame. These small villages in Peru are nestled in the Cordillera Blanca, a majestic mountain range that contains several of the highest peaks in South America. As the glaciers melted, metal-rich rocks were exposed to the air for the first time in thousands of years. Mount Washington, despite its small stature (6,288 feet) when compared to many mountains around the world, experiences a regular onslaught of brutal cold, wind and icing that arguably exceeds in severity the climate of all other places on Earth. On August 23, 2018, documentary filmmaker Bob Elfstrom and the six-person production team boarded a 383-foot Russian research ship, the Akademik Ioffe, at Kugaaruk, an Inuit village on the Gulf of Boothia high in the Canadian Arctic. 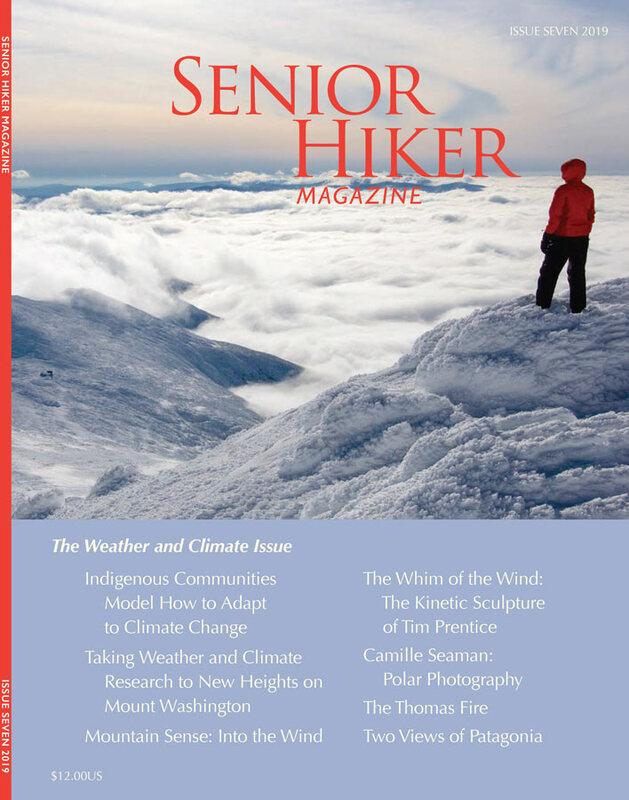 Each issue of Senior Hiker has spirited articles on hiking and the wilderness experience, poetry, beautiful photography, and other artwork inspired by wilderness. Regular columns include practical guidelines on hiking (Mountain Sense), descriptions of hikes in international locales (Exotic Hikes), hiking group profiles (Hard Corps); and accounts of hiking misadventure (Hell Hikes). A subscription to Senior Hiker makes a thoughtful gift to the older hiker, nature lover and adventurer you know. Writers, artists, photographers, and scientists are welcomed to submit ideas or short abstracts for personal narratives, scientific articles, photo and artwork essays, and specific columns (Mountain Sense, Exotic Hikes, Hard Corps, and Hell Hikes). We also publish poetry and letters to the editor. Senior Hiker has high production values, a clean look and no commercial advertising. We partner with educational, environmental and wilderness organizations to help support their programs through events, informational ads in the magazine, and links to their websites.